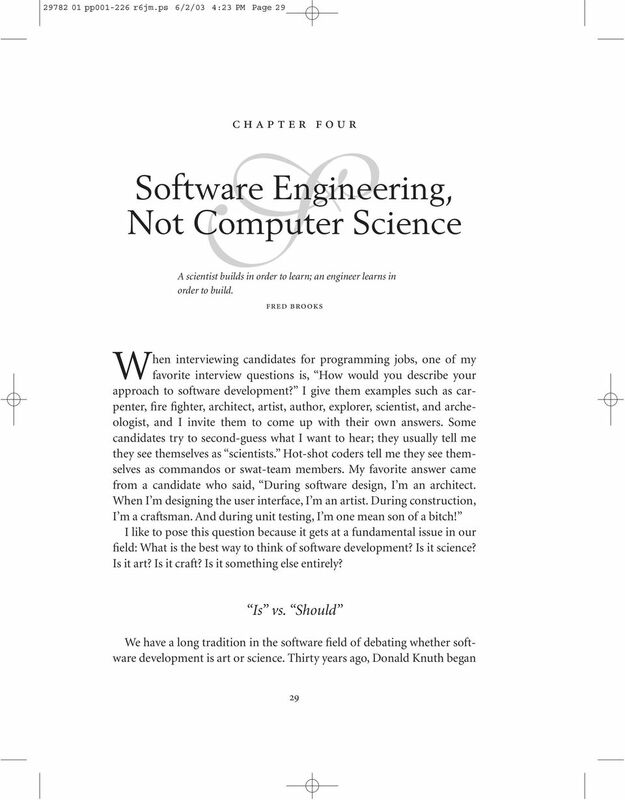 Software Engineering, Not Computer Science. A scientist builds in order to learn; an engineer learns in order to build. 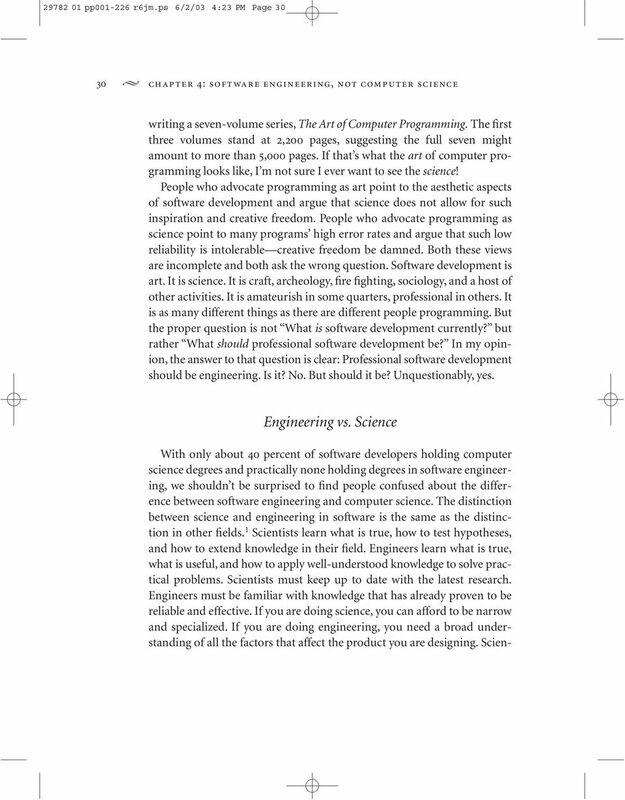 Download "Software Engineering, Not Computer Science. A scientist builds in order to learn; an engineer learns in order to build." 5 98 0 pp00-6 r6jm.ps 6//03 :3 PM Page 33 Beyond the Buzzword 33 matical proofs. Common sense and experience tell us that that is overkill for many projects. Others object that commercial software is too dependent on changing market conditions to permit careful, time-consuming engineering. These objections are based upon a narrow and mistaken idea of engineering. Engineering is the application of scientific principles toward practical ends. If the engineering isn t practical, it s bad engineering. Trying to apply formal methods to all software projects is as bad an idea as trying to apply code-and-fix development to all projects. Treating software as engineering makes clearer the idea that different development goals are appropriate for different projects. When a building is designed, the construction materials must suit the building s purpose. I can build a large equipment shed to store farming vehicles from thin, uninsulated sheet metal. I wouldn t build a house the same way. But even though the house is sturdier and warmer, we wouldn t refer to the shed as being inferior to the house in any way. The shed has been designed appropriately for its intended purpose. If it had been built the same way as a house, we might even criticize it for being over-engineered a judgment that the designers wasted resources in building it and that it actually isn t well engineered. 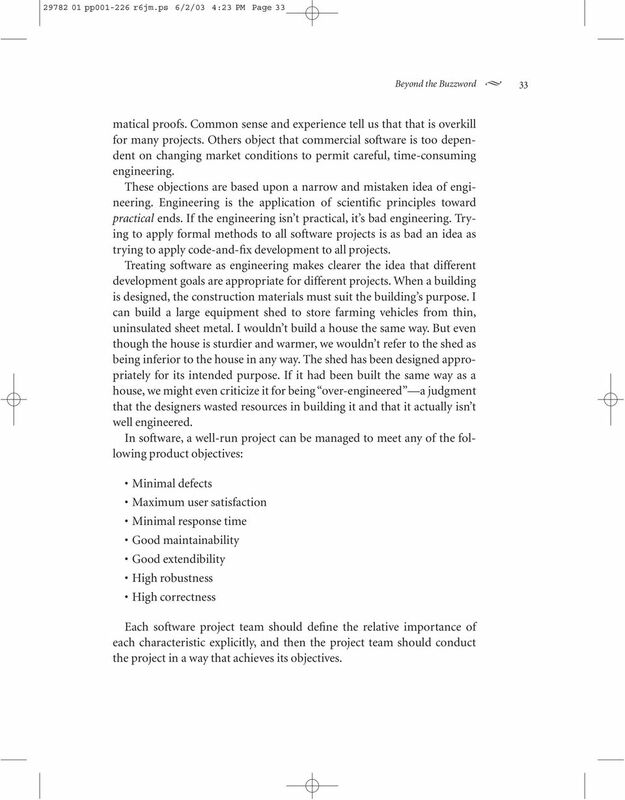 In software, a well-run project can be managed to meet any of the following product objectives: Minimal defects Maximum user satisfaction Minimal response time Good maintainability Good extendibility High robustness High correctness Each software project team should define the relative importance of each characteristic explicitly, and then the project team should conduct the project in a way that achieves its objectives. 7 98 0 pp00-6 r6jm.ps 6//03 :3 PM Page 35 Notes 35 could do for a dime. Economical development is also the domain of software engineering. Today s pervasive reliance on code-and-fix development and the cost and schedule overruns that go with it is not the result of a software engineering calculation, but of too little education and training in software engineering practices. The Right Questions Software development as it s commonly practiced today doesn t look much like engineering, but it could. Once we stop asking the wrong question What is software development currently? 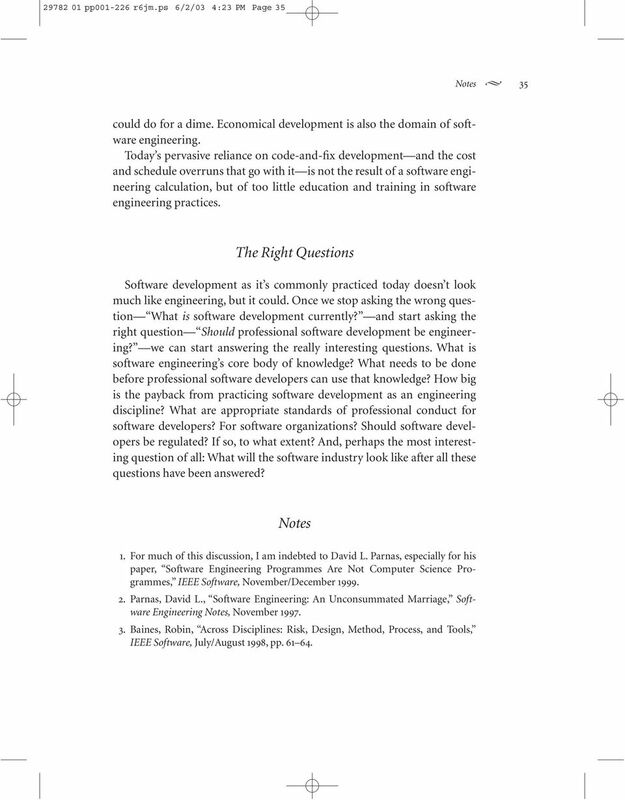 and start asking the right question Should professional software development be engineering? we can start answering the really interesting questions. 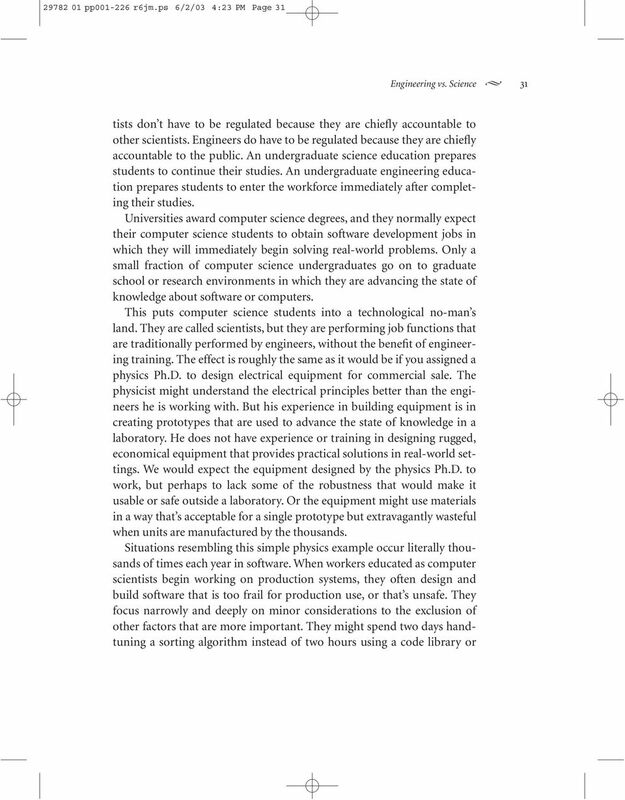 What is software engineering s core body of knowledge? What needs to be done before professional software developers can use that knowledge? 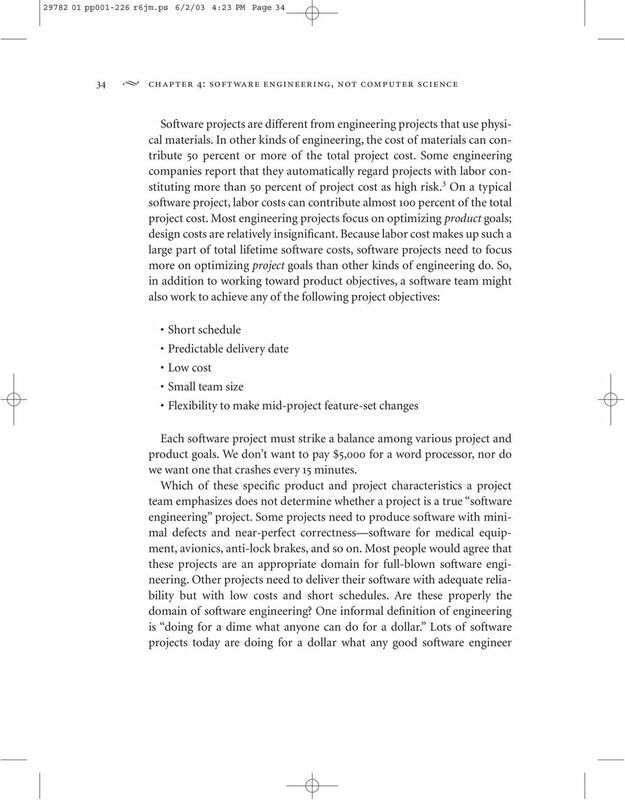 How big is the payback from practicing software development as an engineering discipline? What are appropriate standards of professional conduct for software developers? For software organizations? Should software developers be regulated? If so, to what extent? And, perhaps the most interesting question of all: What will the software industry look like after all these questions have been answered? Notes. 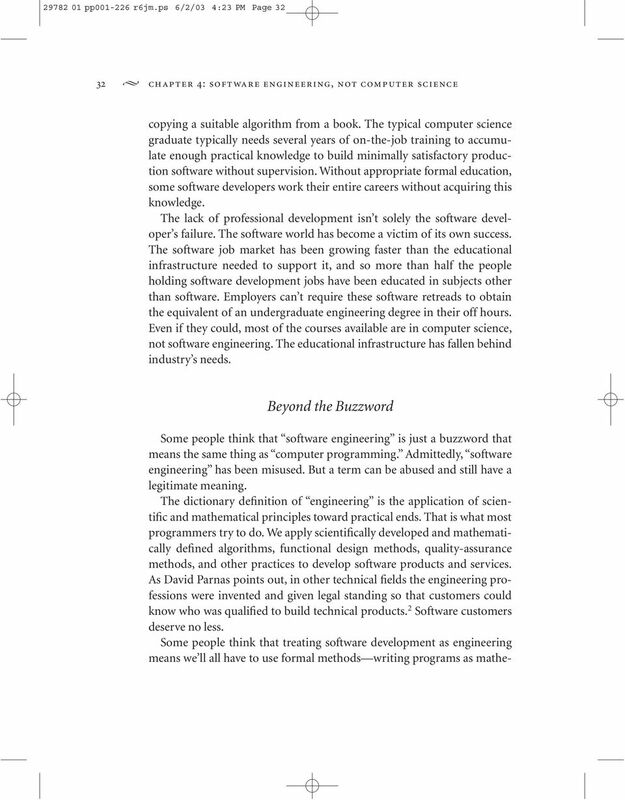 For much of this discussion, I am indebted to David L. Parnas, especially for his paper, Software Engineering Programmes Are Not Computer Science Programmes, IEEE Software, November/December Parnas, David L., Software Engineering: An Unconsummated Marriage, Software Engineering Notes, November Baines, Robin, Across Disciplines: Risk, Design, Method, Process, and Tools, IEEE Software, July/August 998,pp.6 6. QUESTIONNAIRE SOFTWARE DEVELOPERS WRITE A CODE OF ETHICS. 2. What sort of organization do you work for? What do you do there? How to Make More Money in the Fitness Industry DEANNA REITER, M.A. Do Students Understand Liberal Arts Disciplines? WHAT IS THE EDUCATIONAL PURPOSE of the curricular breadth encouraged at liberal arts institutions? Expert Reference Series of White Papers. What Is Formal Project Management and Who Needs It? Everything You MUST Know. Before Hiring a Personal Injury Lawyer! Why Should Businesses Care About Wage and Hour Laws? We want to know what you think Please tell us what you think about npower. We have asked Ipsos MORI, a leading independent research company, to help us collect feedback to improve the services we provide.